As a rule, trends are difficult to predict—and the rule definitely applies to transit. From new legislation to groundbreaking technology, there's always something impacting the industry's trajectory. After reading tea leaves and consulting the stars, here's what we anticipate 2018 has in store for public transportation. Prediction #1: Google/Waymo will launch an autonomous TNC. Uber and Lyft have nibbled around the edges with autonomous vehicles, but Waymo has more autonomous miles under its belt AND a significant user base (thanks, Google Maps!). 2018 will be the year that Waymo rolls out a TNC in order to utilize its significant advantages on those fronts, forcing Uber and Lyft to cut prices even further. Prediction #2: Private companies won't be the only ones cozying up to the autonomous vehicle trend. We predict public transit agencies will begin experimenting with autonomous shuttles. Prediction #3: Uber will go public, but Lyft's growing market share will accelerate as it becomes the most impactful company in the ride-sharing/ride-hailing marketplace. Prediction #4: Lyft’s number of rides for individuals with disabilities will increase in 2018. Given Lyft's banner year in this space, including its partnership with MBTA and their work with Trapeze, 2018 will see Lyft continuing to invest in the paratransit space, along with new agency and software partnerships. Prediction #5: We already saw some major partnerships take place in 2017, but we predict you'll see consolidation in the market driven by major corporations shifting to the mobility space. Prediction #6: Not only do we foreshadow the microtransit trend continuing in 2018, we also anticipate significant growth in trials and experimentation with agency-owned microtransit. While 'microtransit' isn't exactly new to the transit industry vernacular, use of the term and the movement itself certainly gathered steam in 2017. 2018 will be the year the industry has enough pilots on the road and data points to understand how, when, and why agency-owned microtransit works—and also when it doesn't. Prediction #7: Demand-driven planning will take a giant leap forward. As a movement, microtransit is predicated on agency-owned, demand-driven transportation. Public transit planning historically has relied on older, stale data (such as the past Census, which is at this point 8-years old). Thanks to new data acquisition and analysis techniques coupled with pressure from outside market influences, transit agencies and cities will be forced to reimagine how they plan for the mobility of their constituents. Prediction #8: Initial microtransit successes will happen outside normal 'innovation centers. New York, San Francisco, and Boston won’t be the first cities to enjoy true, efficient agency-owned microtransit services. Instead, look to small-to-medium sized metros and 'second cities' like Raleigh-Durham, Sacramento, and Nashville to be the early adopters of this blossoming movement. Prediction #9: Dockless bikeshares will rapidly proliferate. Bike shares are already popping up in many places that didn't already have a bikeshare program— and quickly. (In Durham, it took less than six months!) We predict you'll see an these everywhere as the bikeshare trend continues to gain popularity. The reason for the proliferation? No upfront cost from city AND the provision of data from bikeshare companies back to the city. These two items help remove traditional blockers that get in the way of technological deployments. As an added benefit to riders, bikeshares, dockless or otherwise, provide an interesting FM/LM addition to the transportation ecosystem. What are your predictions for 2018? 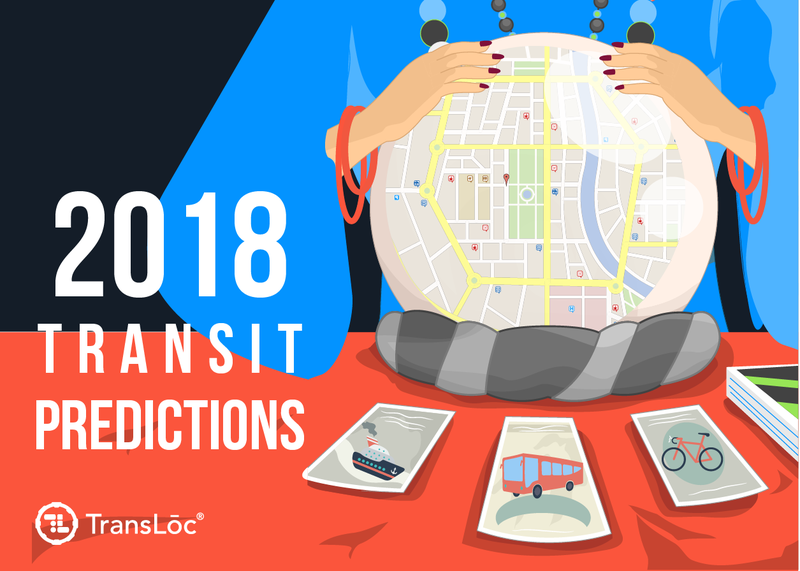 Check out our 2017 transit predictions.